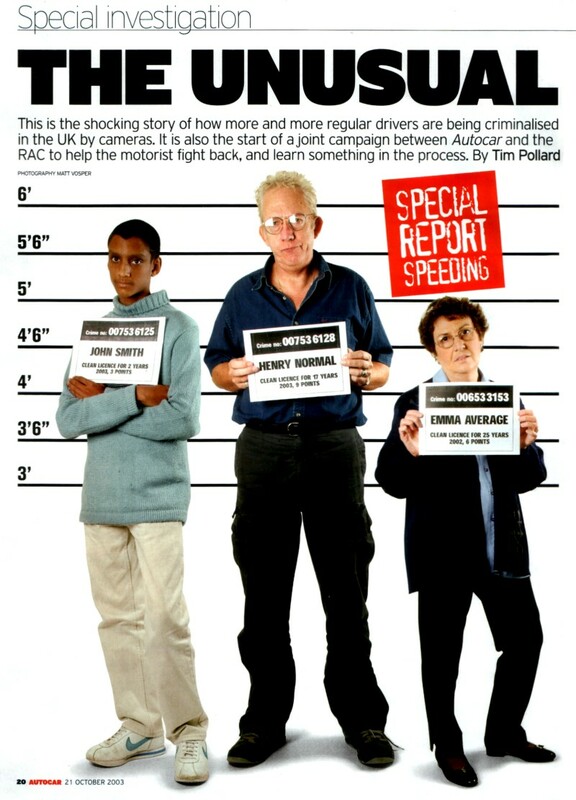 The Talking Sense on Speed campaign launched 20th October 2003. 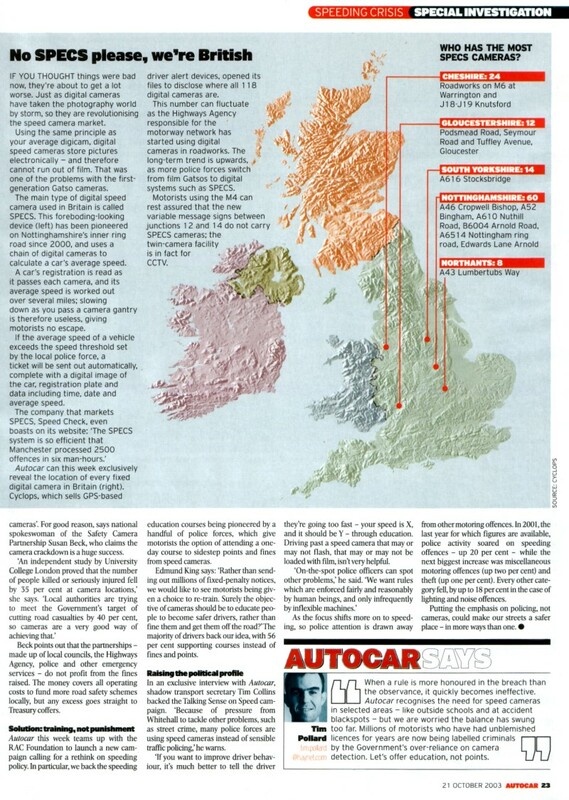 It is jointly conducted between Autocar Magazine and the RAC Foundation. 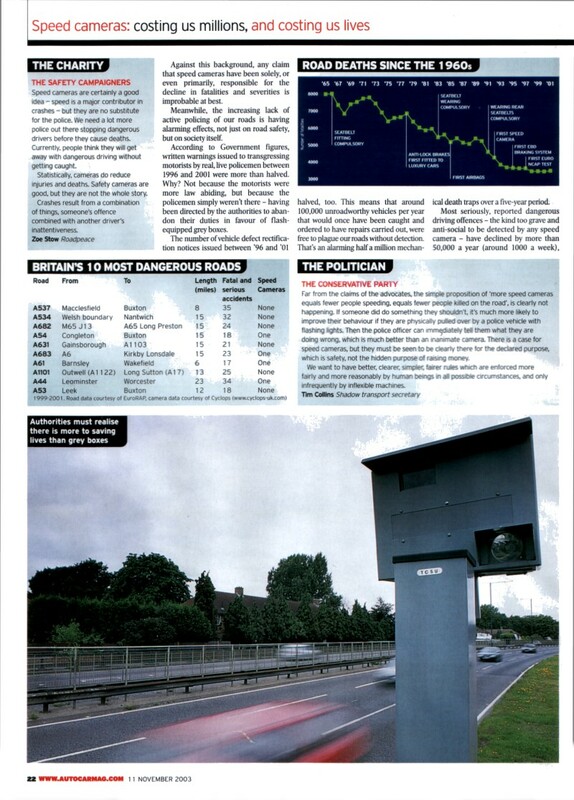 Less than a quarter of motorists would be very likely to report someone defacing a speed camera to the police. While the vast majority (75 per cent) of motorists do not condone the actions of safety camera vandals, the credibility of remote enforcement has fallen to such an extent that most of the drivers questioned in the NOP World MotorBus survey admitted that they would rather turn a blind eye than speak up. The campaign aims to get an increase in the number of Speed Awareness Courses offered to motorists in lieu of three penalty points as many motorists caught by speed cameras could benefit from these tailor-made courses. The campaigners will write to the Prime Minister, Home Secretary, Transport Secretary, Scottish Executive and Association of Chief Police Officers seeking support. The percentage of drivers with penalty points on their licences for speeding offences has risen by more than a quarter in the past five years, according to the new survey, with the number of motoring offences dealt with in 2001 at 10.5 million - the highest ever. 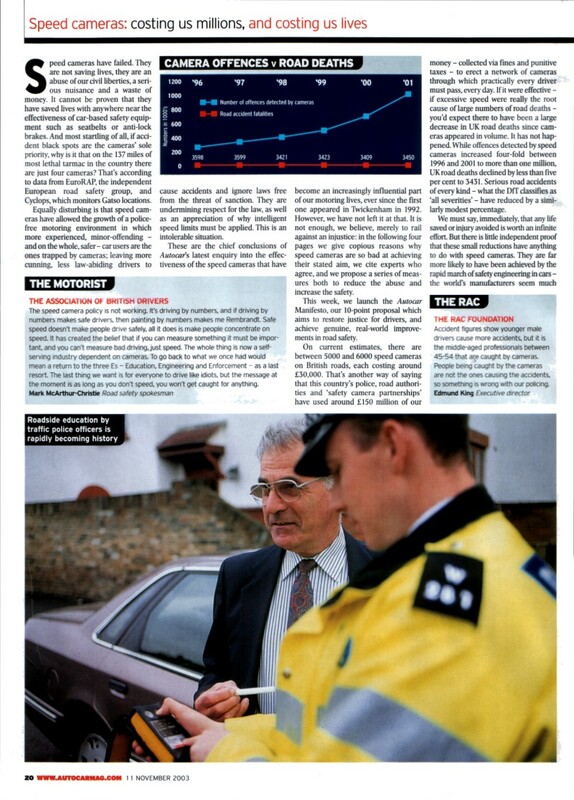 maximising the number of fines should be the priority for police. 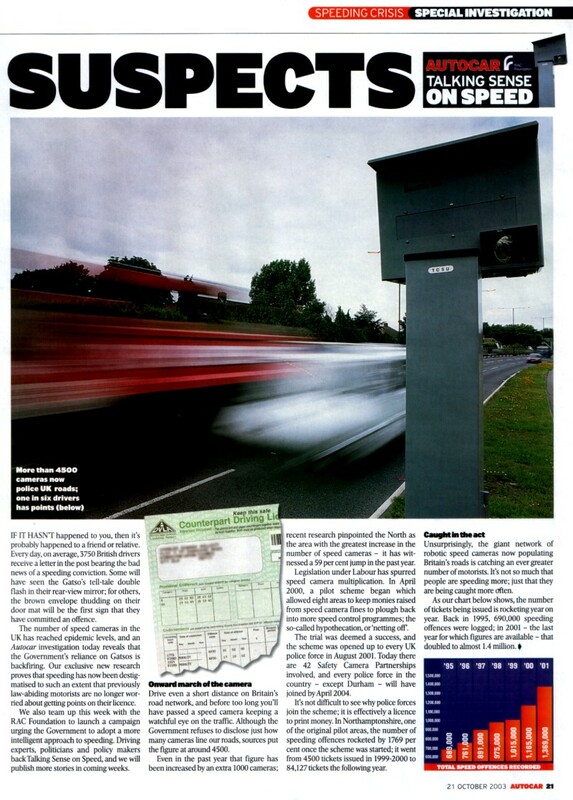 RAC Foundation and Autocar would like to see more specific courses for those receiving fixed penalty notices from speed cameras. These courses would be paid for by offenders as an alternative to points. The leading local authority involved in such courses is Lancashire. Their course started in 2001 and last year 8,690 drivers completed the course. By September this year almost 15,000 drivers had been on the course. These courses are self-funding with the drivers paying £85 - which covers a theory and practical element. Ironically these courses are only offered to drivers caught driving at exactly 35 mph in a 30 limit. Other schemes have been set up in Staffordshire, Northamptonshire, Lincolnshire and in the Thames Valley. It is likely that a working group will be set up to look at some national guidelines. The Campaign is calling for courses to be offered to drivers caught speeding above the ACPO guidelines. The academic evaluation of the Lancashire course by Steve Stradling at Napier and Michelle Meadows at Staffordshire University shows that it does have positive effects on road safety. "The reduction in speed which drivers reported driving at on high streets occurring between being offered a place on the course and actually attending the course was not statistically significant. The reduction in speed in the three months after attending the course was significant. In other words, merely being caught speeding did not affect high street driving speed. It was attendance at the course that brought about the speed reduction". Dr M L Meadows. 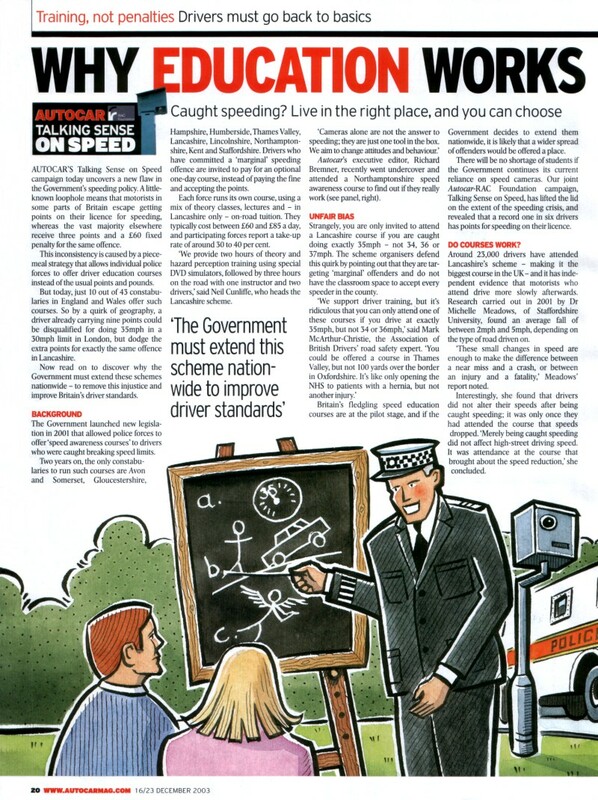 The Campaign aims to lead a responsible debate on speeding issues through the pages of Autocar, national media and amongst MPs and Ministers. Edmund King, executive director of the RAC Foundation said "There is a role for camera enforcement at traffic lights and accident blackspots but we should certainly not rejoice at a million plus prosecutions. The camera should be one weapon in the police armoury rather than the entire arsenal. We have seen a correlation between the increase in speed cameras and the decrease in traffic police. Rather than sending out millions of fixed penalty notices we would like to see motorists being given a choice to re- train. Surely the objective of cameras should be to educate people to become safer drivers rather than fine them and get them off the road?" Offering more flexible and shorter schemes for less serious offences. 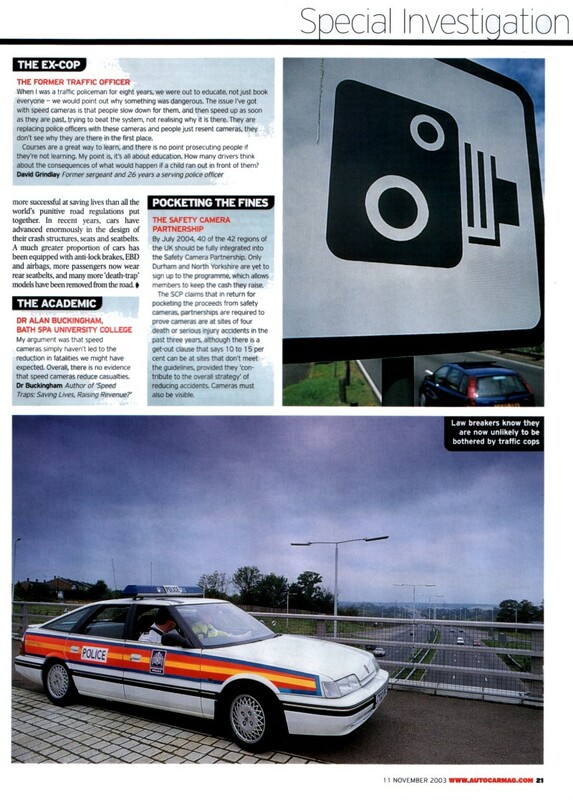 The RACF/Autocar Talking Sense on Speed Campaign also wants to change the emphasis in camera enforcement. Many motorists see the Safety Camera Partnerships as more intent on revenue than safety as some of the proceeds from fines are re-invested in more cameras. Now the Partnerships could have a real opportunity to show that safety and education should be the priority. According to King: "If we are prosecuting over one million people per year for speeding offences then it is high time that we reviewed some of our speed limits. The camera does not discriminate between night and day or wet and dry. 20 mph may be an appropriate speed limit outside a school when children are around but probably not at 2am. "The Government should review the limits rather than increase prosecutions. We would like to see a package of measures including a specific driving course in lieu of penalty points, a review of speed limits and greater use of interactive speed signs rather than a constant increase of cameras." 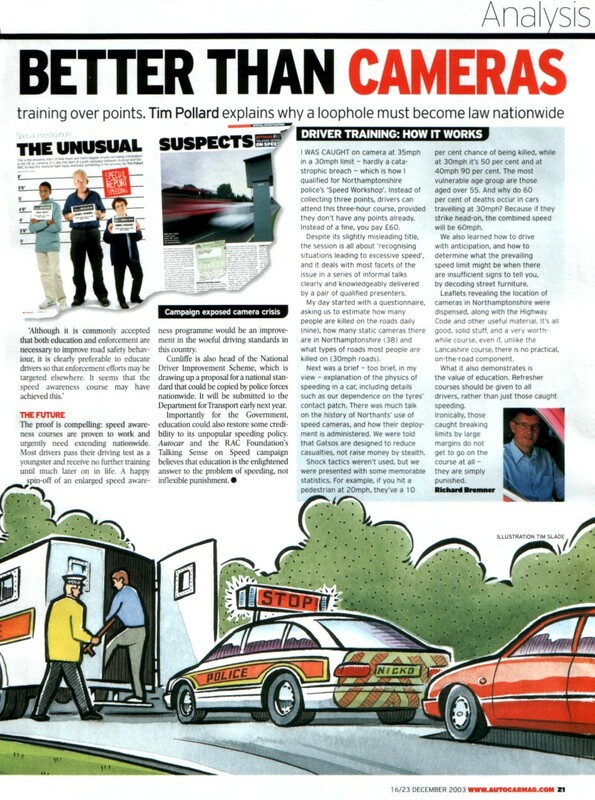 "We feel the balance has shifted too far in the speeding debate. 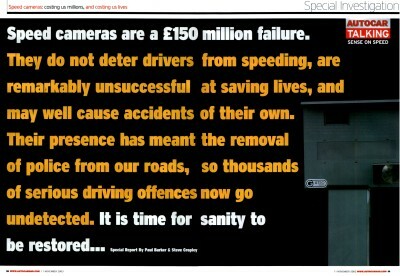 Speed cameras can be used sensibly to save lives, but the situation is spiralling out of control. I could imagine a situation soon where the majority of motorists have points on their licence. We want the Government to start offering driving courses instead of points. 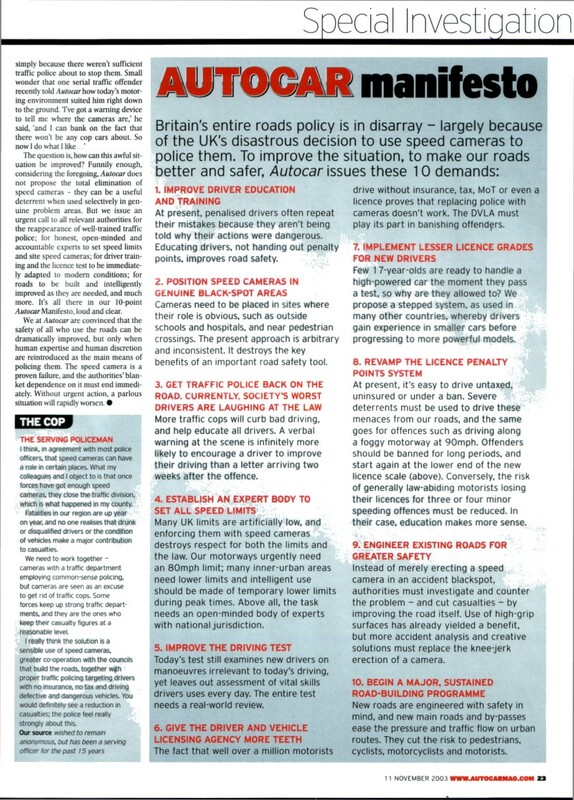 Only by educating motorists, can you change attitudes." Click the images for a full sized readable version. Use your browser's "back" button when done. 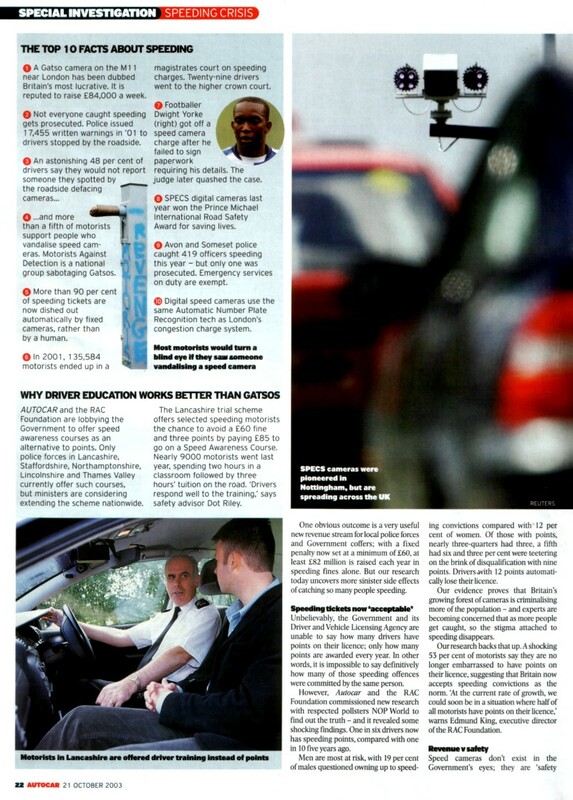 Safe Speed comments: Autocar here are calling for more "speed awareness courses" as an alternative to fines and points. We disagree strongly that "speed awareness courses" are a good idea - in fact we think such courses are actually dangerous. The courses focus on numerical speed and feed false safety messages to drivers. Feeding false safety messages to drivers distorts their safety priorities and in the real world may well make them more dangerous.